If the hard drop-topped 2010 Volvo C70 convertible heading to Frankfurt later this month and unveiled today looks familiar to you, it should. It's a spittin' image of the Volvo S60 concept car unveiled in Detroit earlier this year. Bodywork details like the front wings have also been redesigned, while the nose is more wedge-shaped. It's been given added three-dimensional depth by moving some elements of the front. 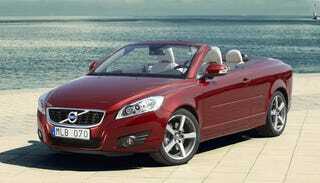 On top, the C70 convertible gets the same Ikea-like three piece folding hard top as the last generation. On the interior, the instrument panel's been redesigned, giving it a wider, sleeker look. We're also told by Volvo, the surface of the panel has a new texture designed to enhance "the feeling of quality." Right. Who needs actual quality when you can just enhance the feeling of it.